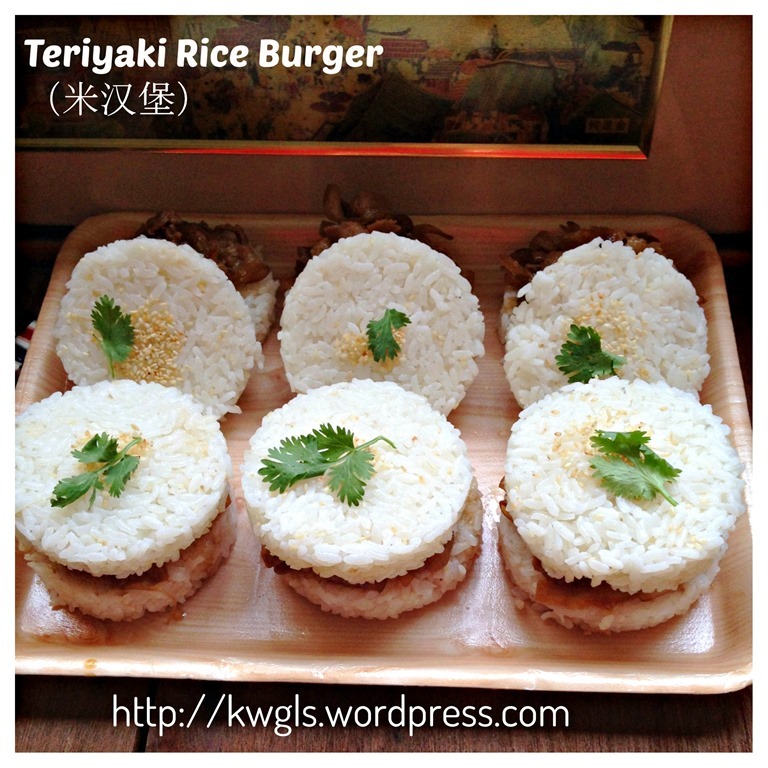 My wife bought back almost 20 rice burgers when she visited her friends in Taiwan last month. 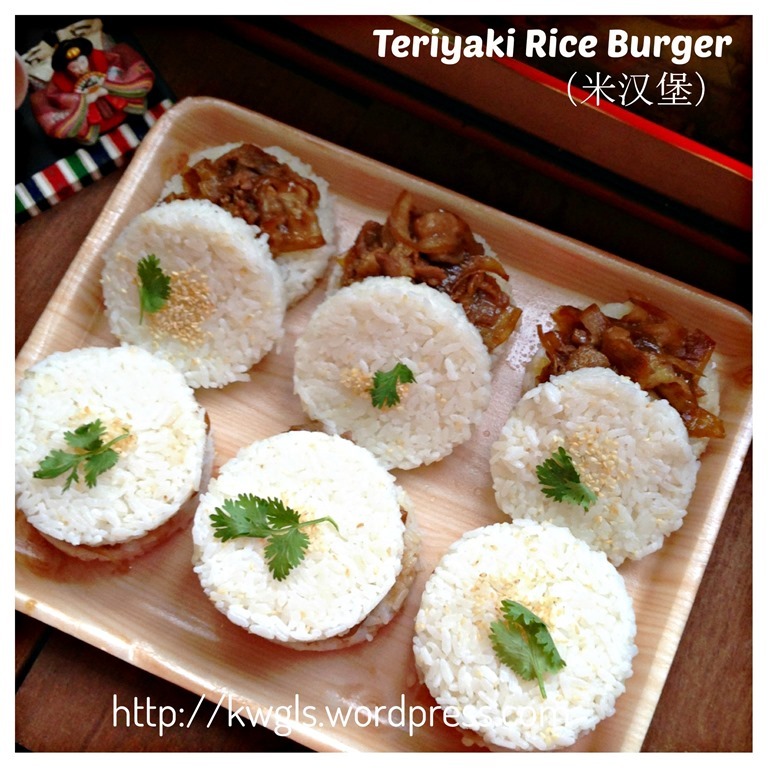 She tasted the rice burgers and she is so happy with the burger that she wanted us and her sisters to try these teriyaki rice burgers.. Each of us in my own family was rationed to have 1 each for adult and 2 for the kids. It is not from the famous worldwide chain of restaurant but rather a local Taiwan fast food chain. When i took my first bite, immediately I fell in love with it. 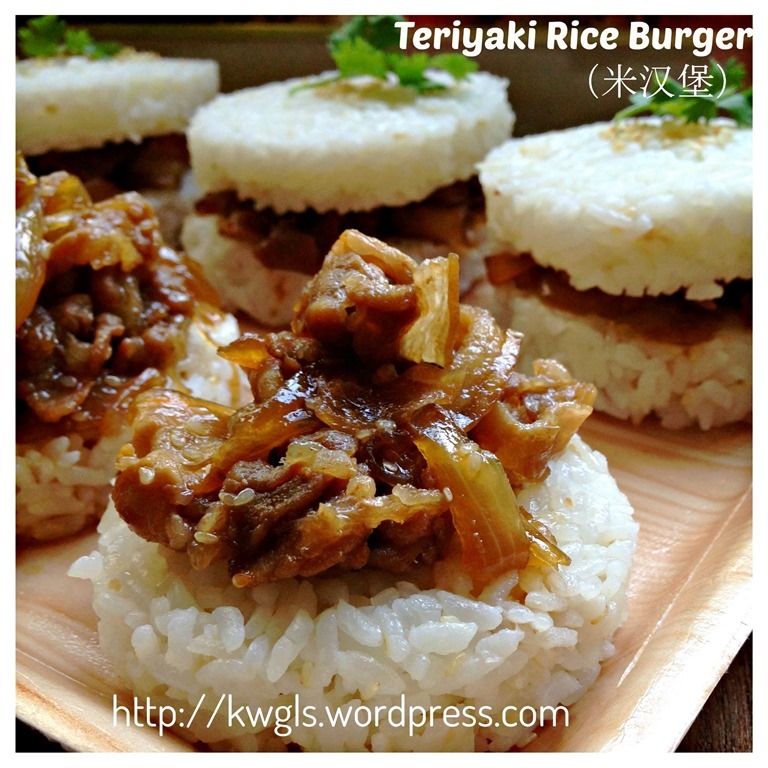 Rice burger is nothing new to me. 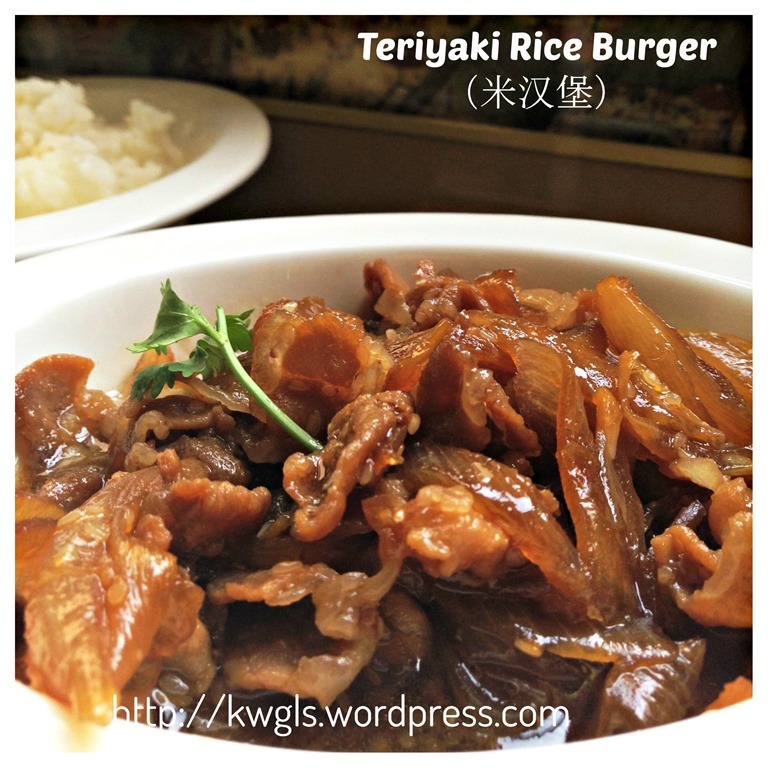 I remembered that I have tasted such burger when I stationed in Shanghai a decade ago but can’t really recall about the taste. 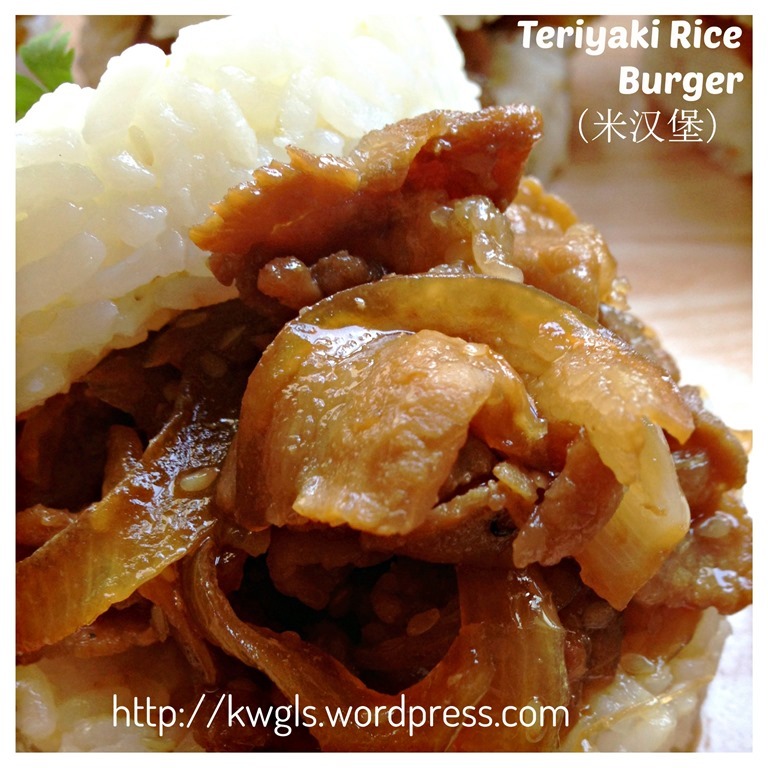 I do know that Singapore MOS Burger have such product but I have never try it. Looking at my kids fighting for the burgers, I have decided to try to replicate what I have eaten. I believed it is not difficult to replicate as it was a familiar taste. 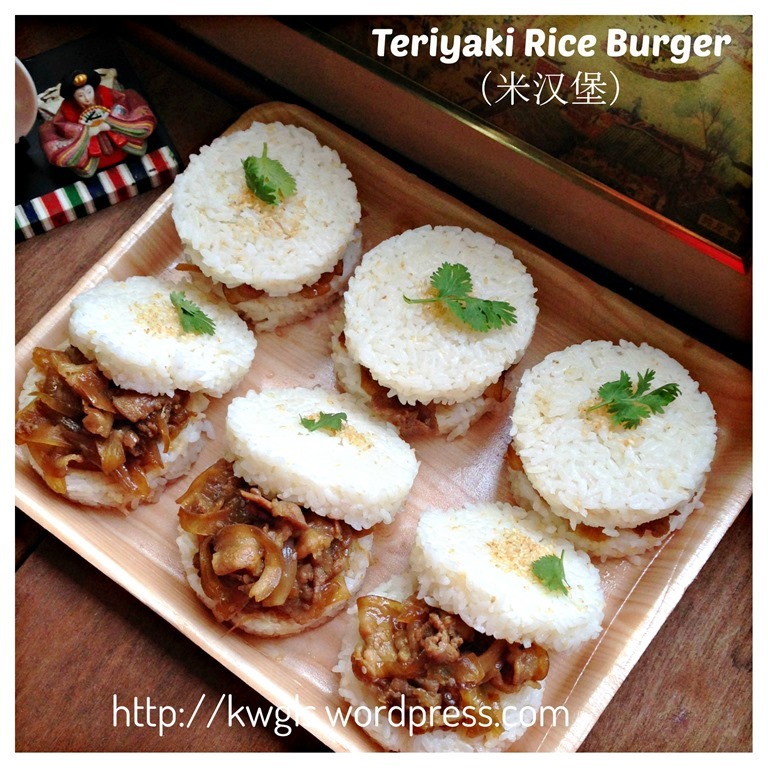 On Friday, we headed to the supermarket to buy some Calrose or pearl rice, some pork belly slices meant for steamboat purposes and with the Japanese condiments available in my kitchen mostly bought from Daiso Singapore, I prepared these rice burger for dinners. The entire family enjoyed it very much and each of us have 2 rice burgers for that meal. 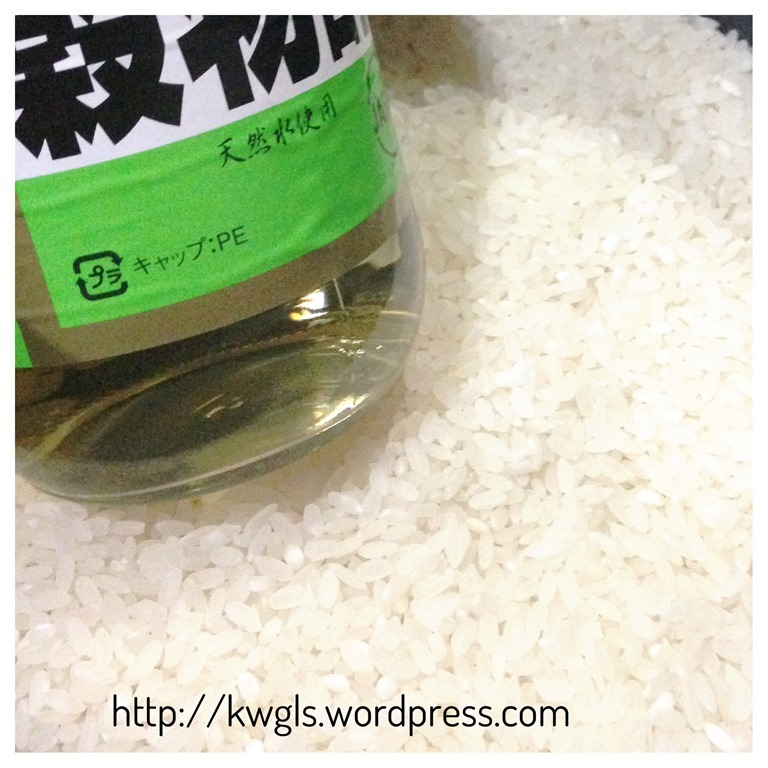 We finished all the 3 cups of Calrose rice..
Do not think that preparation is difficult. It is not. It is extremely easy. I would described it as a one pot dish, if I may use such a term. 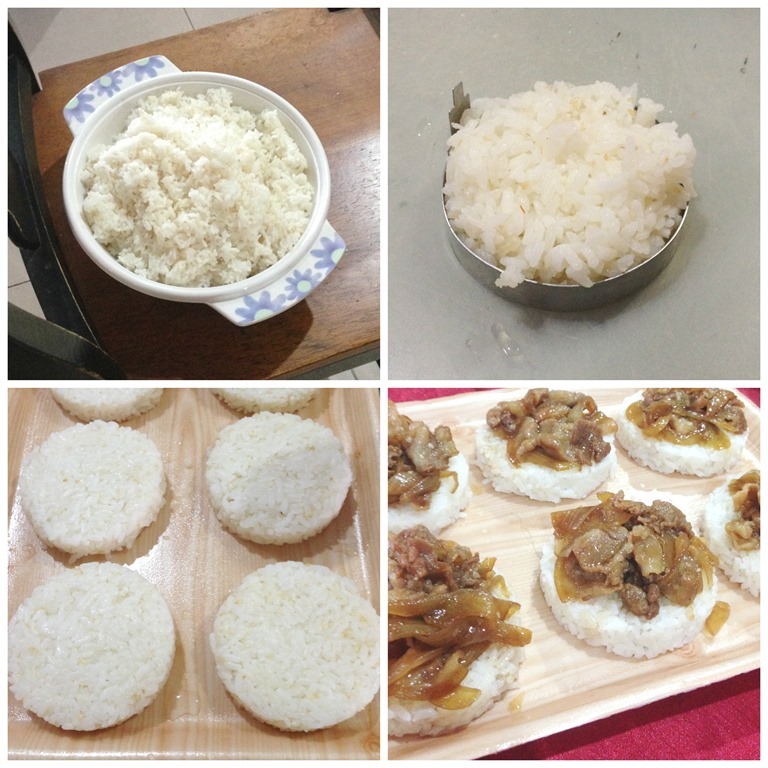 It took me about 1.5 hours to prepare the meals and that include the designing, cooking and assembly the dish.. For most, the dish can be ready in 30-45 minutes..
Wash the rice and cook the glutinous rice, Calrose or pearl rice IN ACCORDANCE WITH YOUR RICE PACAKAGING INSTRUCTION. For this illustration, I was required to use 1 cup of rice with 1.25 cups of water. Therefore, I have used 3.75 cups of water for the rice. But it varies with age and brands of the rice. Note that long grain rice are not ideal as it is not sticky enough. If you do not have this short grain rice, you can use some long grain rice with some glutinous rice in the ratio of 4 cups of normal rice with 1 cup of glutinous rice). Once cooked, drizzle the rice vinegar (optional) on top of the cooked rice when it is hot. Put some sesame seeds (about 1 cup of rice with 1 tablespoon of sesame seed). 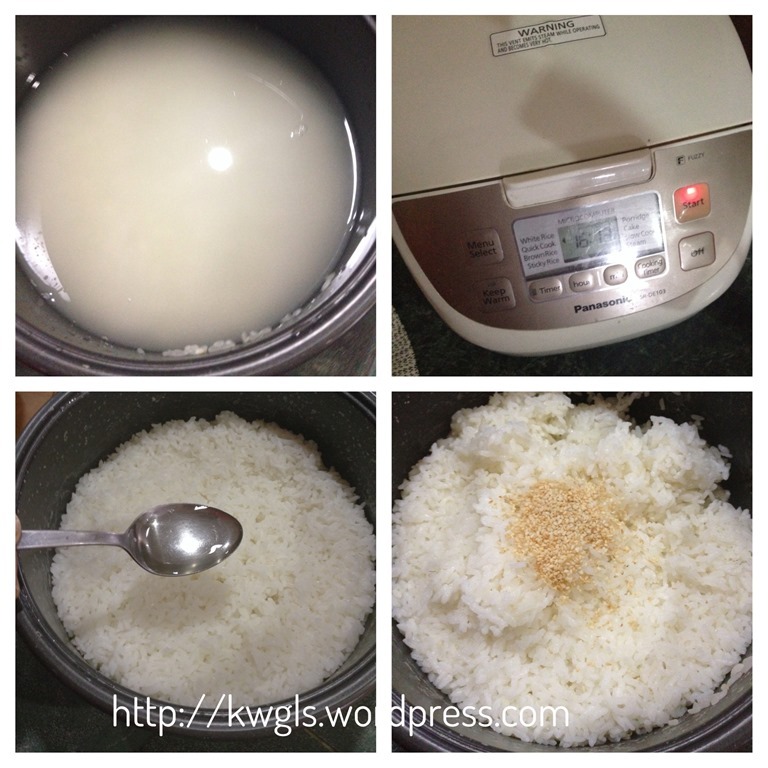 Fluff the rice and put in the rice cooker if your pork slices are not ready. If your teriyaki pork slices are ready, put it under a fan to cool. But use a towel to cover the rice to prevent the rice from losing its moisture. 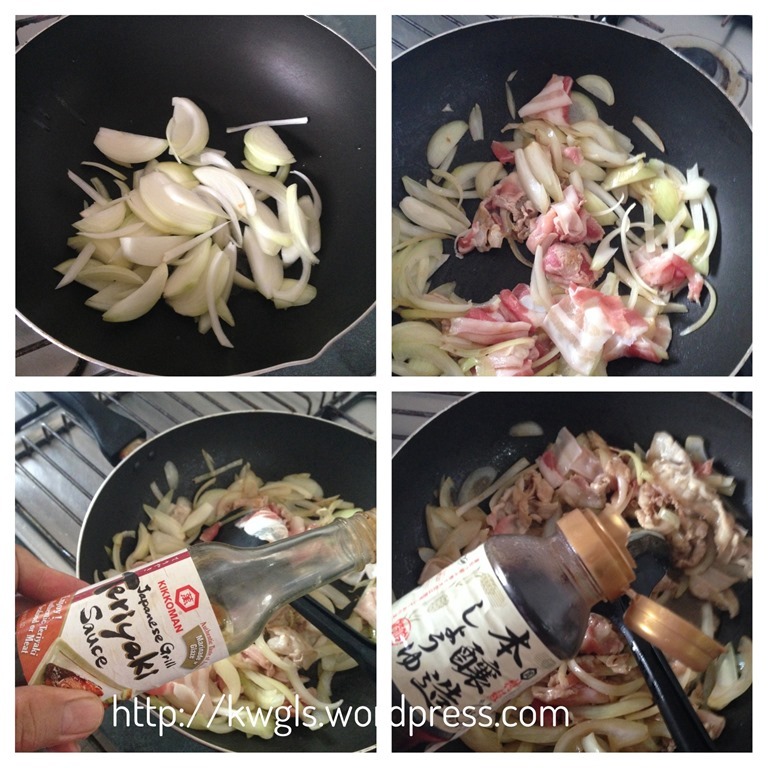 In a pot with 2 tablespoons of cooking oil, sauté onion until fragrant. 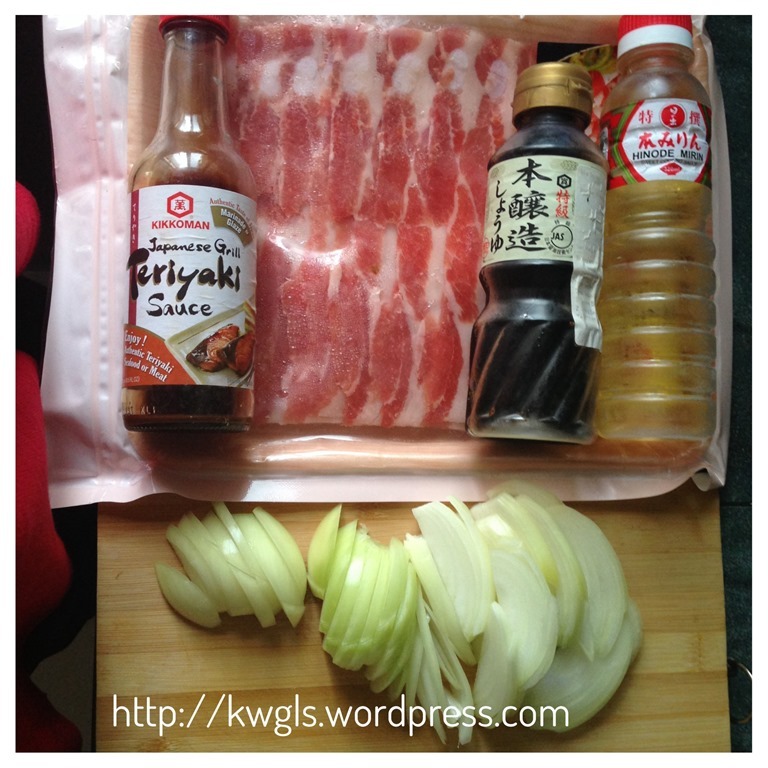 add the sliced pork belly meat, stir fry until well mix. 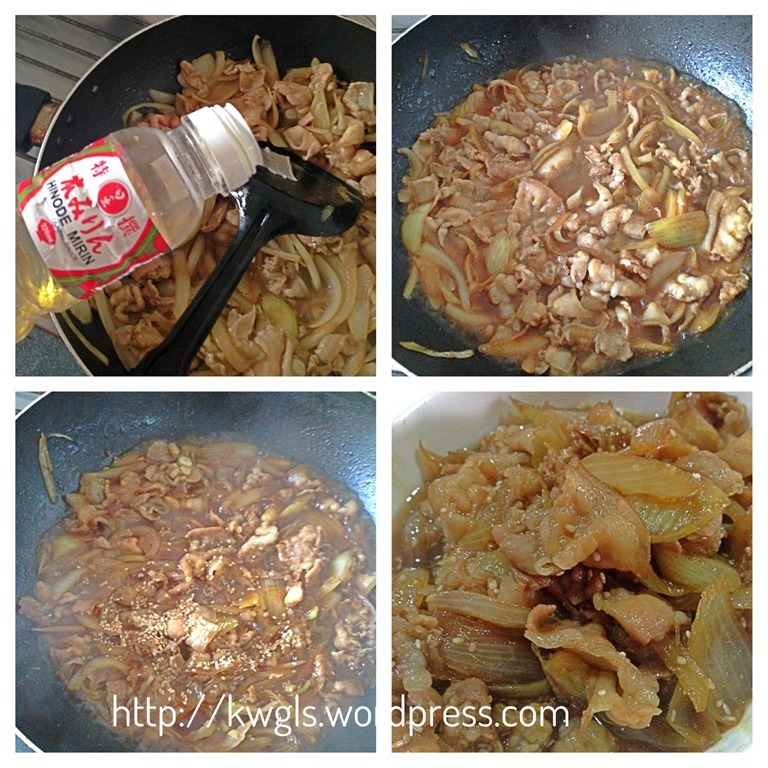 Add the teriyaki sauce and Japanese light soya sauce, stir fry until well mix. Add the Mirin and about 1/2 cup of water and bring to boil. Once boiled, lower down the heat to let it simmer until the meat is soft and the sauce dries up. Add sugar for taste and a touch of glaze. Sprinkle with about 2 tablespoon of sesame seeds and transfer out for cooling and later assembly. You may want to take out some of the meat and taste if it suits your taste buds. Add additional seasonings if necessary. 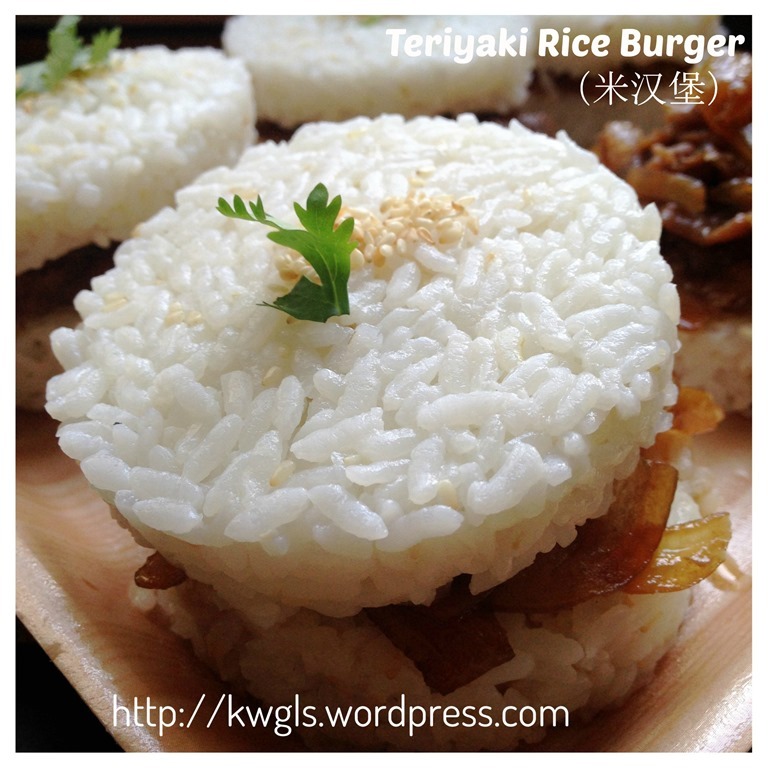 Take some warm rice and place it on top of something round and pressed it down firmly. For this illustration, I have used a metal frame designed for the making fried eggs for burgers. 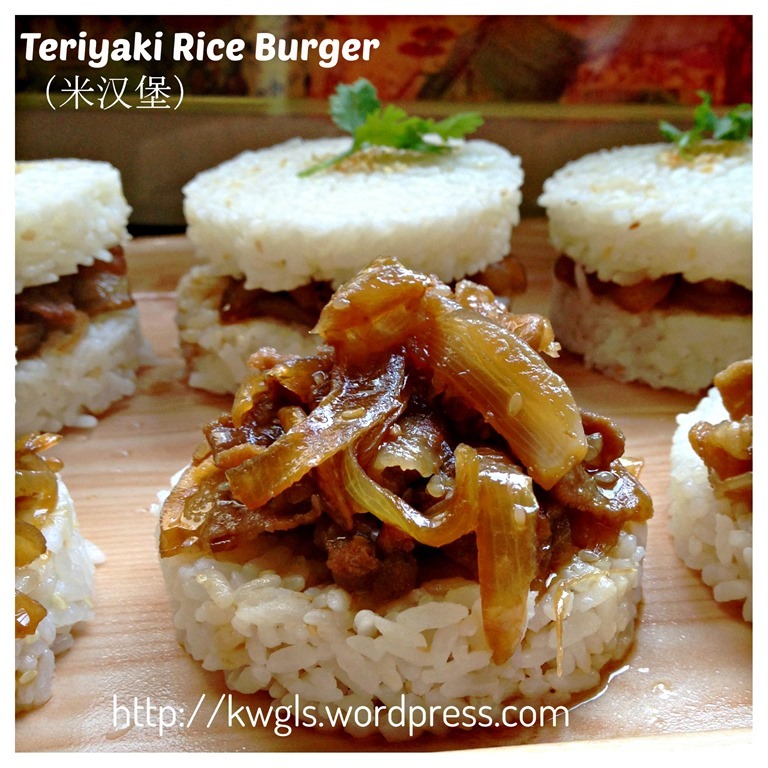 Take the rice burger out carefully, place in the serving plate. 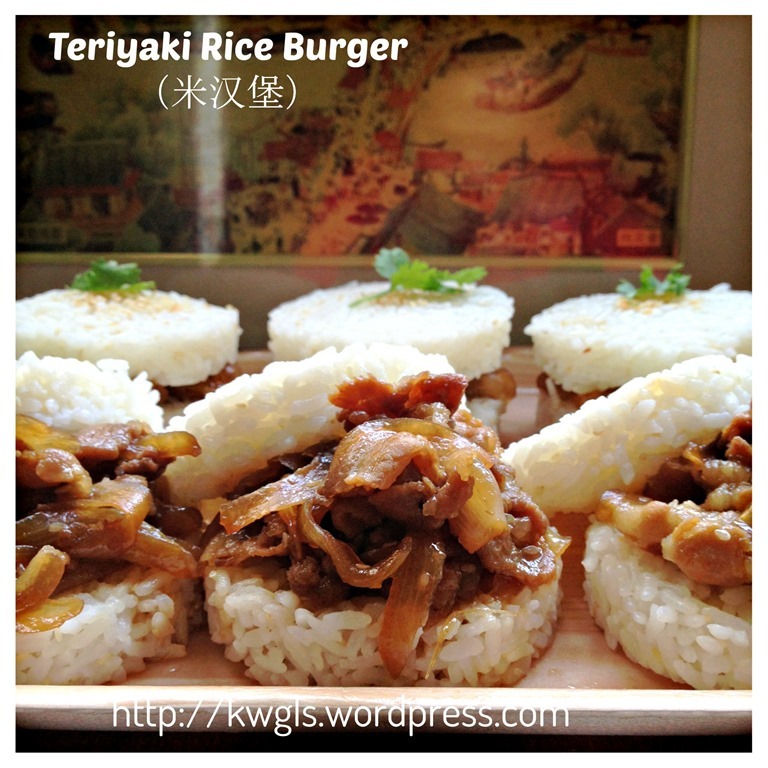 Put 1-2 tablespoons of teriyaki meat slices on top of a side of rice burger and drizzle with some sauce. Cover with another side of a burger. Sprinkle with additional sesame seeds if desired. Best served warm as a snack or a one pot dish. Is it difficult? No, it is not. If you can’t get hold of the metal frame, use anything. Roll the rice out into your desired thickness. Use a cup to press down to get hold of the shape. Firmness is required. You can also get these Japanese condiments easily and at a reasonable price at Daiso chain stores worldwide. 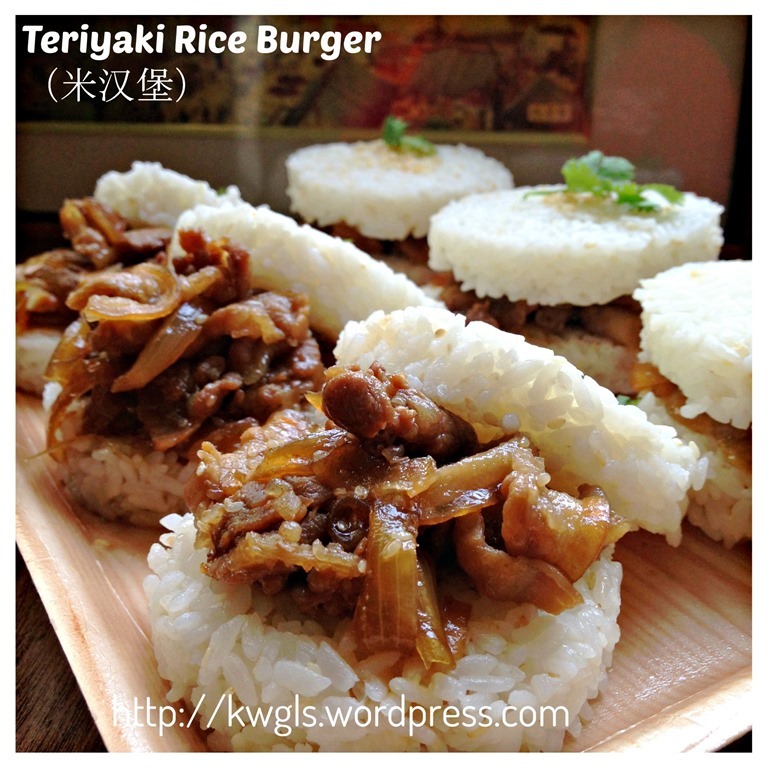 In addition, you can also substitute with sukiyaki beef slices if you preferred. 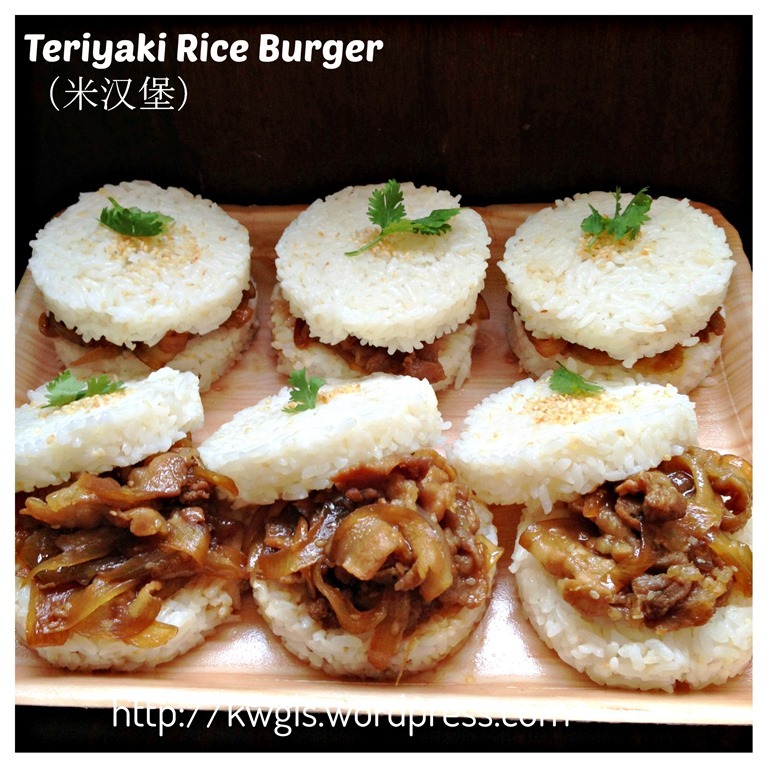 My family especially like the teriyaki pork belly slices and we concurred that it is at least 90% like those Taiwanese rice burger that I have eaten before. Pardon me for not being humble.. Do give it a try . 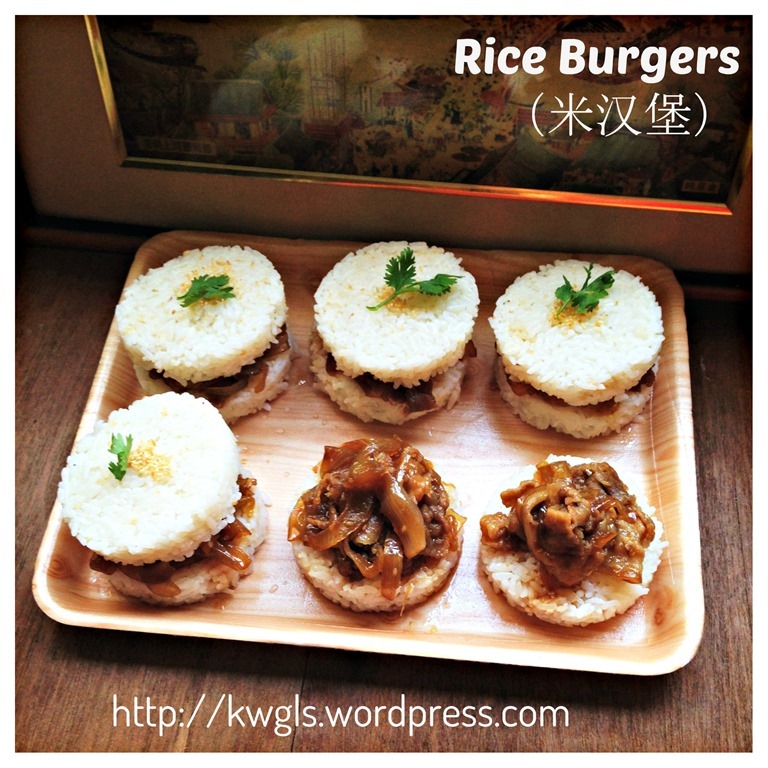 This entry was posted in Breads and Pizza, Chinese and Asian Cakes and Snacks, Food Preparation Series, Noodles, Rice and Others and tagged 8, 米汉堡，rice burgers, GUAI SHU SHU, Guaishushu, kenneth goh, postaday, teriyaki rice burgers. Bookmark the permalink.